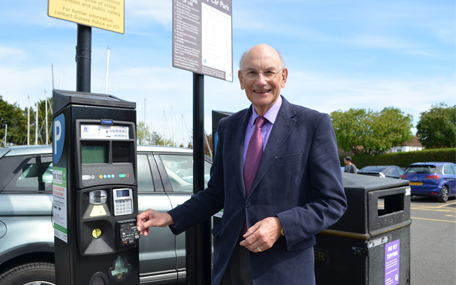 Parking payment machines in rural car parks across Chichester District have been updated to allow customers to use the latest technology when paying for their parking. The work to update the facilities in all rural car parks in the district was completed last month. The new machines offer customers a variety of payment methods, including coins, card and contactless. The new machines are also more environmentally friendly and will reduce the council's electricity costs because they operate using solar power. Further savings will also be made because fewer coin collections will be needed. "We aim to provide payment options which are modern, innovative and which meet our customers' needs," says Councillor Tony Dignum, Leader of Chichester District Council. "We are very pleased to be able to offer these facilities in all of our car parks across the district to make life easier for our residents, workers and visitors. "It is very encouraging that the new payment options are already proving popular, and we expect this to continue over the coming months as more people come to visit our rural towns." Customers are also able to pay to park in all council owned car parks using the MiPermit smartphone app, which has proved very popular. More information about our car parks is available on our parking web pages. People can also find out more about MiPermit on their website.